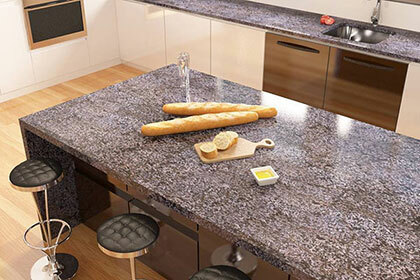 There's a reason everyone loves natural stone countertops. They look amazing, they're incredibly durable, and they add class to any room. Your fireplace: All of the attributes that make natural stone so desirable as a countertop material also apply to your fireplace surround. It's durable and scratch-resistant. It comes in an array of colors and patterns. And it is heat-resistant, which makes it perfect for fireplace surrounds. Your walls: Granite isn't just for countertops and fireplace surrounds, it also works extremely well as walls. Your sinks: If you really want to elevate your kitchen or bathrooms from good to great, consider working with your fabricator to create custom sinks. You can create a spa-like bathroom of your dreams by designing and installing a hand-crafted, custom sink. And don't just limit it to your bathroom, you can do the same for your kitchen. Your shower: While creating a spa-like experience in your bathroom starts with an over-sized, custom-designed sink, it's put over the top through a shower manufactured from natural stone. Not only will natural stone stand up to the constant pounding of the water, but it looks great and feels wonderful under your feet. Yes, natural stone is not just for countertops anymore. You can integrate it into your bathrooms to create a spa-like experience, elevate your kitchen by creating hand-crafted sinks and use it on a wall that will become the focal point of your home. Actually the opportunities to integrate the inherent beauty of natural stone into your entire home are endless.